Brace posts with metal brace and brace wire running diagonally from upper second post to lower end post. Once you’ve decided where to put your fence, put your brace posts in. 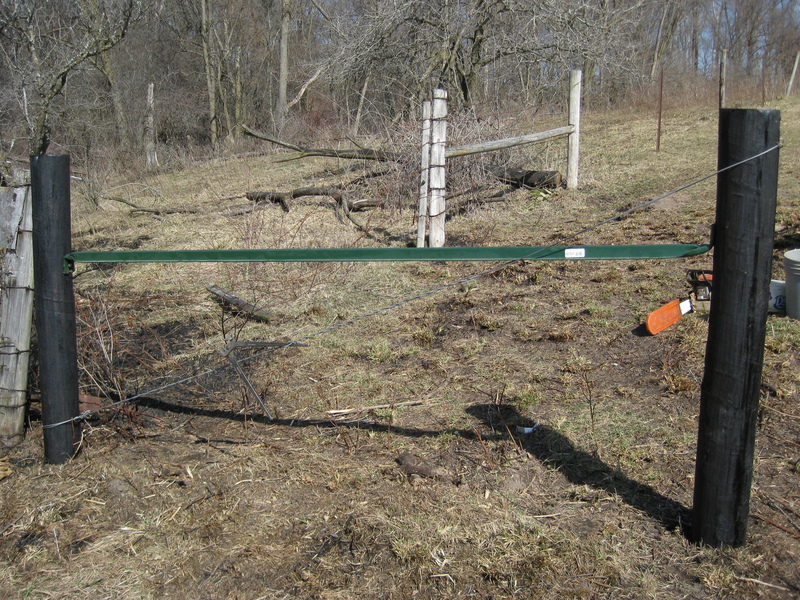 You need a set of brace posts on each end of your fence in order to pull the barb-wire tight. You can also have more, based on your needs. We put six sets of brace posts in this quarter mile of fence because we put a space for a gate, and had to fence across two valleys. 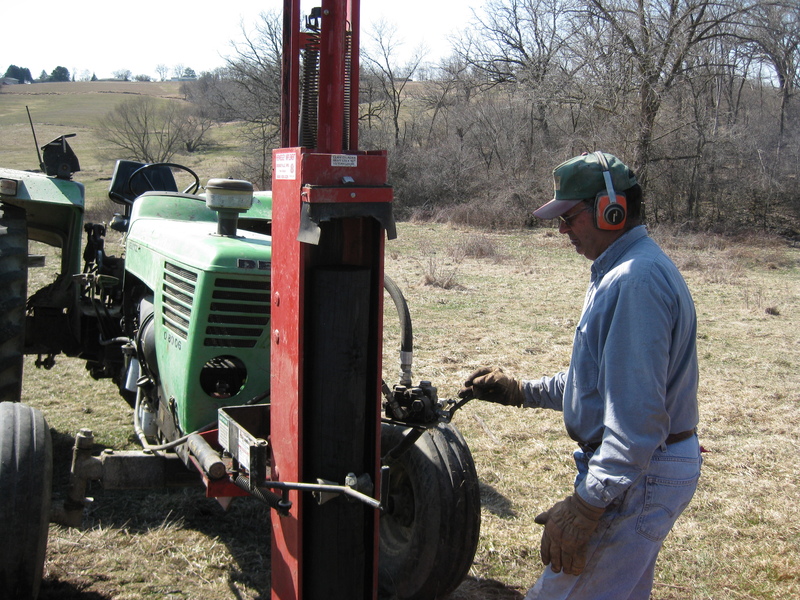 We use six-inch diameter, eight-foot long, creosote-treated posts and pound them into the ground about three feet for our brace posts. The posts in the interior of the fence are five-inch diameter, seven-foot long creosote-treated posts. We have found no other wood treatment comes close to creosote for preserving wood from rotting. It is frustrating to build a new fence and watch the wooden posts rot off in ten or fifteen years. The metal brace is secured to the posts with a lag-bolt. We put our brace in level, about two-thirds up the posts. Many people are putting the brace at the top. The old-fashioned way is to put the brace at an angle. This has the tendency to pull one of the brace posts out of the ground, though. The brace wire is run through a staple at the top of the second post, around the posts, and through a staple at the bottom of the end post. After it is tied, I use the handle of a fencing pliers to wind it, thereby tightening it. 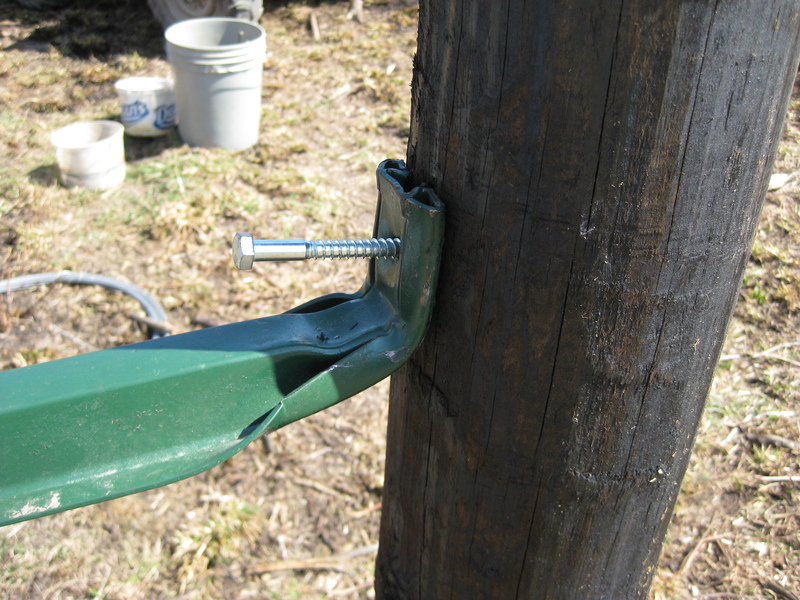 This pulls the two posts together against the brace, making an excellent anchor to stretch barb-wire for your fence. This entry was posted on Tuesday, May 25th, 2010 at 7:52 pm and is filed under Curious cattle, Curious livestock costs. You can follow any responses to this entry through the RSS 2.0 feed. You can leave a response, or trackback from your own site. 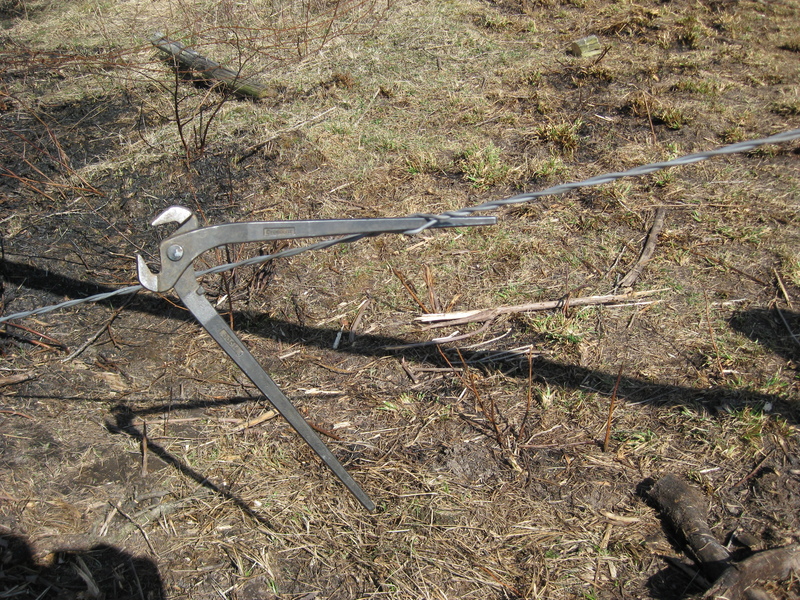 The brace: prevent pushing – First, the two posts should have been installed closer. Next, the metal brace should be at the top of the “end” post of the fence. Why? The force pulling on the top of the end post from woven/barbed wire will push against the “bottom” of the 2nd post ensuring no movement. Think of the leverage missing from this photo. Try pushing a post at ground level! The wire: prevent puling – the rectangle is strengthened by “pulling” counter-forces together through a tight heavy-duty wire. This is correct in the photo but does little for overall total support with the incorrectly installed brace.